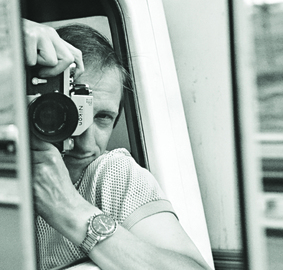 Peter Darley took his first motorsport photographs in 1961. Prior to that he had just been keen on motor sport, competing several times at the Prescott hillclimb in a Mini Cooper. He would to go to races with friends and spend most of his time wandering round the pits and paddock with his trusty Minolta camera. Getting many favourable comments from friends he showed the photos to, he was encouraged to try and sell his images, and decided to start at the top – Team Lotus. After submitting some images to Cheshunt, he received a letter back from Team Lotus saying that Mr Chapman liked his photos and would like to order somemore. In 1965 they went onto a more formal basis, with Lotus requesting specific shots and the connection with Lotus also lead to work for other companies who supplied Team Lotus, such as Ford, Esso, and Firestone. Peter continued to work with Team Lotus until the end of the sixties when he became Competitions Manager of Britax, the seat belt company. This was follwed by two spells at Broadspeed Engineering, the saloon car kings of the late 60s and early 70s, where he helped run Ford Capris for Dave Matthews in England and Claude Bourgoignie in Belgium. Later he became Special Projects co-ordinator on the Jaguar XJ12 Coupé project, as well as the Triumph Dolomite Sprint racers. Peter now lives in the Cotswolds with his wife Sue and three dogs. He still attends many motorsports events.